I love bootstrap, don’t get it twisted. Just a good example of submenu frustration. 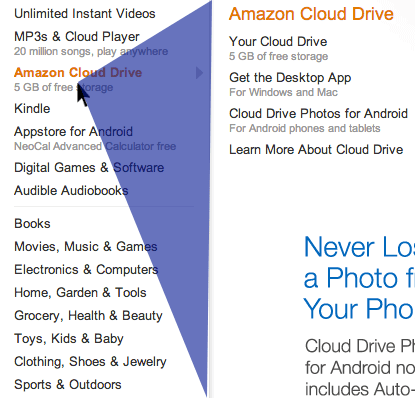 It’s easy to move the cursor from Amazon’s main dropdown to its submenus. You won’t run into the bootstrap bug. They get away with this by detecting the direction of the cursor’s path. If the cursor moves into the blue triangle the currently displayed submenu will stay open for just a bit longer. And if the cursor goes outside of the blue triangle, they instantly switch the submenu, giving it a really responsive feel. I think it feels snappy. I’m not ashamed to copy Amazon. I’m sure this problem was solved years and years ago, forgotten, rediscovered, solved again, forgotten, rediscovered, solved again. 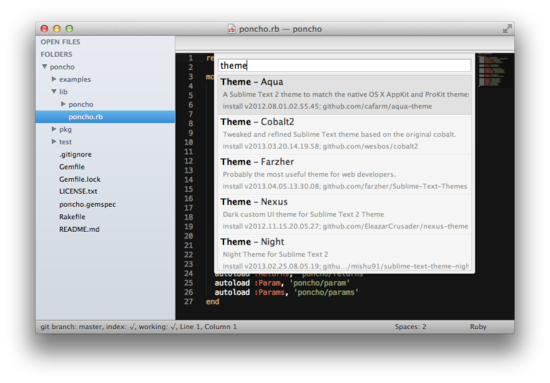 If anyone else on the planet ends up finding a use for jQuery-menu-aim, I’d be grateful to know what you think. Thanks go to Ben Alpert for helping me understand the linear algebra / cross-product magic Amazon uses to detect movement inside the “blue triangle.” I ended up going w/ a cruder slope-based approach, mostly b/c I’ve lost all intuitive understanding of linear algebra. Sad. Need to watch more KA videos. See also our other tools at Médialab Tools! I massively use this excellent js library to convert colors. If you have not done it yet, look at this post. You’ll understand much useful things about color in dataviz. Very famous tool, that showed the way few years ago. If you do not know it, you must take a look. Sometimes I just need to type garbage. Just to clear out my mind. Using editors to type such gibberish annoys me because it clutters my project workspace (I’m picky, I know). As you hopefully have heard, we at scikit-learn are doing a user survey (which is still open by the way). One of the requests there was to provide some sort of flow chart on how to do machine learning. As this is clearly impossible, I went to work straight away. Needless to say, this sheet is completely authoritative. Thanks to Rob Zinkov for pointing out an error in one yes/no decision. More seriously: this is actually my work flow / train of thoughts whenever I try to solve a new problem. Basically, start simple first. If this doesn’t work out, try something more complicated. 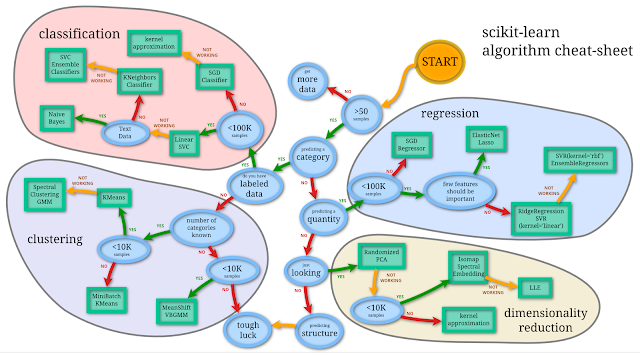 The chart above includes the intersection of all algorithms that are in scikit-learn and the ones that I find most useful in practice. Only that I always start out with “just looking”. To make any of the algorithms actually work, you need to do the right preprocessing of your data – which is much more of an art than picking the right algorithm imho. For me, the worst kind of bugs are those were the solution, in hindsight, seemed so obvious. You end up more frustrated with the bug after knowing the fix. HackerRank has hosted college-focused hackathons before, but on February 2, it plans to connect some of the top coding talent in universities with some of the best-known companies in Silicon Valley. Developed by the same company behind InterviewStreet, a site where companies find programmers by hosting “CodeSprints,” the HackerRank service launched last fall at the TechCrunch Disrupt conference. Co-founder Vivek Ravisankar said the goal is to create a community where hackers can complete programming challenges and see how they stack up against others. Unlike Coursera and Udacity, HackerRank is less focused on teaching you the basics of programming and more on letting coders practice their skills, he said. For now, Ravisankar said that InterviewStreet is the company’s moneymaker, while at HackerRank he’s just trying to “build the user base and a very sticky platform.” Ultimately, he plans to make money by connecting programmers with companies they want to work for, but he said that will be a purely opt-in system. As for the upcoming Back to School Challenge, Ravisankar said he has realized that college students, especially those who don’t go to a school in the San Francisco Bay Area, don’t really know much about Silicon Valley. The contest’s main prize is supposed to address that. The top 10 competitors will receive an all-expenses-paid trip to Silicon Valley, where HackerRank has organized tours at a number of companies, including Quora, Counsyl, PocketGems, OpenTable, RocketFuel, Weebly, Scribd, Pinterest, and Twitter. There are other prizes — the top prize includes $2,000, a meeting with a partner at Y Combinator, and office hours with the HackerRank founders. The contest will take place over 24 hours and consist of five challenges, with the first one focused on artificial intelligence. Ravisankar said he’ll be doing outreach at more than 30 schools, including Stanford, Berkeley, and Purdue, but any college student can participate — you just need to have a .edu email address. Ravisankar said he’s hoping to host these types of Back to School challenges three or four times every year. You can read more and sign up here.